Toppokerdirectory.com reviews what we believe are the best poker rooms in the world. Below you can read more about the aspects we take into account when we review poker rooms. We recommend that you consider the same aspects when you are trying to decide which poker room to play in. A very important aspect of a poker room is its traffic. If the traffic is low, you might find it difficult to encounter other players that wish to play the same poker variant at the same bet level as you. 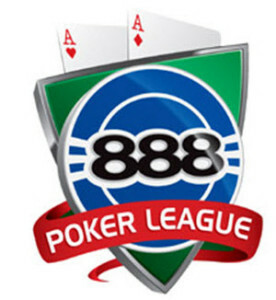 A good source of up to date information regarding poker room traffic is Pokerscout.com. They keep a continuously updated list over the most heavily visited poker rooms and poker networks in terms of cash game traffic. Generally speaking, a large chunk of a poker rooms traffic will end up at Texas Hold’em cash games and tournaments. If you want to play something else, finding a poker room with sufficient traffic to such tables or tournaments will be trickier. If cash games are your thing, the poker room you sign up for shouldn’t just feature cash games with the poker variants that you like, but also have a great selection of games on the betting level you can afford to start playing on. If you have a small bank roll, ideally sign up for a poker room that has a great selection of micro stake tables rather then risk quickly losing your bank roll on more expensive level. You can also start to play and learn more at a casino that offer simple poker games for you to learn before you start playing at a bigger poker site. Some poker rooms have a huge assortment of poker tournaments, while others stick to a small selection of the most popular formats and buy-in levels. Which poker room that is ideal for you will in part depend on what type of tournaments (if any) you wish to participate in. Do you want quick and inexpensive low-stakes Sit & Go’s or do you enjoy spending a whole evening working through a big Sunday Tournament with a huge guarantee pot? 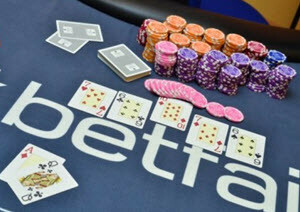 Are you satisfied with Texas Hold’em tournaments or do you want to play other tournaments as well, e.g. Omaha tournaments and 7 Card Stud tournaments? Are you okay with paying big buy-ins, or do you rely on there being a suitable satellite structure available? These are just a few of the questions you need to ask yourself before you pick a poker room. Would you like to play in live poker events? Some poker rooms are more generous than others when it comes to organizing tournaments and other contests online where you can win entrance (or even better, a complete travel package) to live poker events. PokerStars is for instance known to hand out a lot of travel packages since they sponsor big live poker events such as European Poker Tour (EPT), Asia Pacific Poker Tour (APPT) and Latin American Poker Tour (LAPT). Since PokerStars is such a huge poker room, you need to compete against a lot of other players to get your hands on a travel package. Unibet Poker has a much smaller player base than PokerStars, so there are less contestants to defeat – but also fewer travel packages to compete for. Unibet Poker do however have an ace up their sleeve; they arrange their own live event: The Unibet Poker. Fast poker is a type of poker where you are moved to a new hand as soon as you fold. You never have to sit and wait for other players to finish a hand that you are no longer in. Quite a few poker rooms and poker networks offer some type of fast poker. Nowadays, many poker rooms will offer both browser play and a downloadable poker client. Some downloadable clients are still only available for Windows. 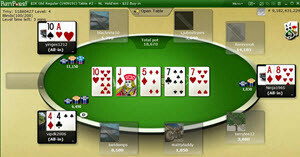 Online poker can be played on mobile devices; either directly in the browser window or through an app. Some poker rooms offer mobile poker apps for a wide range of operative systems, while others only have apps for iOS and/or Android. You can normally play poker in the browser window regardless of operative system. If being able to play poker on your mobile device is important to you, you may also want to check if the poker room you are interested in will allow you to carry out poker account deposits and withdrawals on your mobile device. See the best mobile casinos in EU that offer mobile poker rooms at Mobilcasinon.eu where you also get nice bonuses. How can you reach the support? If you want real time support, pick a poker site that offers phone support and/or live chat support. If real time support isn’t important to you, a site that only offers email support can be acceptable. If you prefer phone support, check the cost in advance. Will you be forced to make a potentially expensive phone call to another country, or is there a domestic number or free phone number available? Is the support offering call-up service (you send them a message by email or live chat and ask them to call you, instead of you calling them)? When do you normally play poker, and will the support be open then? If you normally play poker during Saturday nights, a support that is only open weekdays 9:00 – 18:00 will not be very useful if you need immediate help with something. Is support available in a language that you are comfortable using? Many of the largest poker rooms and poker network – including PokerStars, 888 Poker, iPoker, Party Poker and Full Tilt Poker – blocks players from the USA. Examples of poker rooms that accepts U.S. players are Bodog, Chico, Winning, Merge, Equity, and Revolution. Some European countries do not allow their residents to play on international poker sites. To accommodate this type of gambling legislation, country-specific poker rooms such as PokerStars.it, PokersStars.es, PokerStars.fr, Winamax.fr and PartyPoker.fr have been launched. Swedish poker players should be aware that online poker wins are tax free in Sweden only if they hail from sites based within the EU/EES region. So, a poker win from a site based on Malta will be tax free while a poker win from a site based on Isle of Man will not.